GC Tours offer real discounts to save you money! The most popular Grand Canyon Helicopter Tour from Las Vegas at a great price! Sundance Helicopters most popular Grand Canyon helicopter tour from Las Vegas with the perfect balance of time in the helicopter and time on the ground at the Grand Canyon. Sundance offers limousine service on all tours that fly from Las Vegas to treat all guest like a VIP and make sure you get more helicopter and Grand Canyon time. Fly from the Las Vegas Strip over Hoover Dam, Lake Mead, and into the Grand Canyon for a champagne picnic. Flights from Las Vegas (not Boulder City) are the longest helicopter flights with minimal commute time. 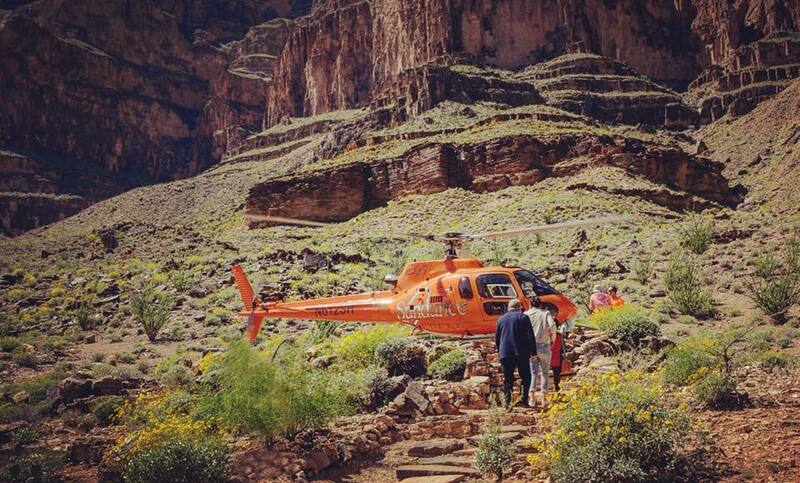 VIP service with 50% or more of your tour is in the helicopter or Grand Canyon! Approx 3.5 hour tour with 1.5 hours flight and 35 minutes in the Grand Canyon. Over 50% of your tour is in the helicopter or the Grand Canyon! Amazing Grand Canyon Sunset Helicopter Tour from Las Vegas at a great price! The dramatic color changes at the Grand Canyon during sunset and flight over Las Vegas before and after sundown make this tour well worth the price. Prepare to be amazed! All Sundance helicopter tours include limousine transfers to and from the airport with a quick check in at the brand new luxurious Sundance terminal. With Sundance you get more time on the ground and the longest helicopter flight time at 90 minutes. If you want over 50% of your tour spent either in the helicopter or Grand Canyon you want Sundance! Flight over Las Vegas Strip and downtown after sundown to see all of the city lights! #1 reason: desert sunsets are amazing! 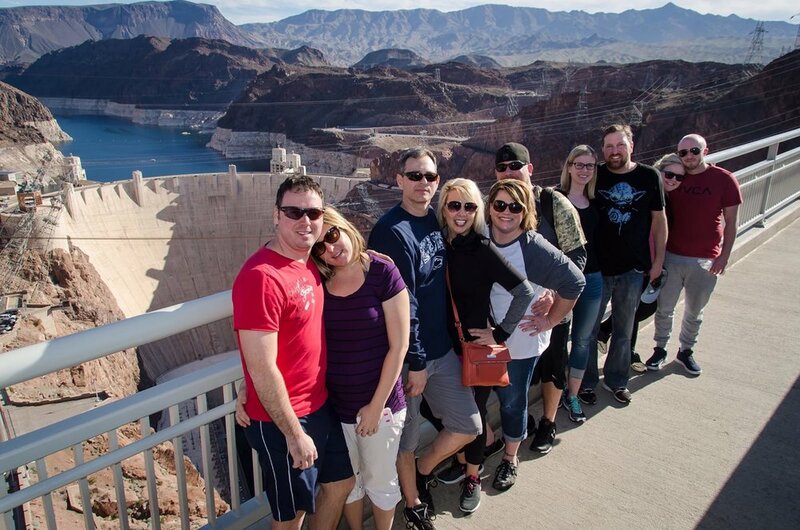 Las Vegas to Hoover Dam with Grand Canyon Helicopter tour plus lunch at restaurant! Sundance have outdone themselves again! This Grand Canyon helicopter tour begins with pick up from your Las Vegas hotel and then brings you to Hoover Dam for a 30 minute photo stop. You then go to the helicopter for a flight through the Mojave desert and into the Grand Canyon. You can add an optional landing at Sundance Helicopters exclusive landing area inside the Grand Canyon where your pilot prepares a champagne toast while you explore and take photos. After your Grand Canyon flight you return to the heliport for a meal at restaurant before heading back to your hotel. Add landing in the canyon for only $40! The ultimate Grand Canyon Helicopter Tour from Las Vegas at a great price! For those fortunate enough to do it all this is the tour for you. You get to see the Grand Canyon from every perspective with this ultimate day tour. This tour includes helicopter from the Las Vegas Strip over Lake Mead, Hoover Dam, through the Grand Canyon to land for a boat ride on the Colorado River. After your boat ride you get another helicopter ride to the top of the Grand Canyon where you have over 3 hours to go to all viewpoints including BBQ lunch. You will see Eagle Point, the Skywalk, Guano Point, and Hualapai Ranch along with Indian Village where they do Indian Dancing and time at the gift shops. You then get a full flight over the Las Vegas Strip on return before landing. An extra bonus, you get limousine transfers from your hotel. This really is an ultimate Grand Canyon Tour. With Sundance, no wasted time! For those looking for the best consider Sundance! Every major helicopter tour company offers a Las Vegas Strip helicopter tour with very similar prices however there are major differences that you should know before you choose your flight. These flights around the Strip are typically between 12-15 minutes long and they fly the same flight path. The differences are in the types of transportation, number of seats in helicopter, and time spent on hotel pick ups and drop offs. With Sundance you fly from the Las Vegas Strip with a champagne toast before your flight. If by chance you get the back right corner seats that face away from the Strip we will refund back $10 per person to your card after the tour. When you book a helicopter tour with GC Tours we typically send your Sundance confirmation within minutes during normal business hours. If you need last minute bookings use our live chat to check for open seats! We only work with the highest rated Grand Canyon helicopter tour companies in Las Vegas and have worked out some great discounts to make it worth your while to book through GC Tours. Unlike other websites that state their retail rate is a discounted rate our discounts are real discounts that can be used for any flight time. We offer helicopter tours that have no hidden fees, no cancellation fees (24 hour cancellation does apply), and we tell you exactly what company you are flying with. It's simple really, just compare our prices to the suppliers price and decide if you want our discount. Why book with GC Tours? If in doubt, contact the supplier and verify our price and details before you book, we show you exactly who you are flying with! Where does the helicopter company get it's business? The short answer is from sources other than customers booking direct. Many people that take helicopter tours book through the hotels and various brokers in Las Vegas. Why? Because many people don't even know about helicopter tours until they get to Las Vegas or decide to take a tour after getting to Las Vegas. The market of resellers of tours include the Hotels, Hotel booking and Review Websites, tour brokers, travel agents and more. Naturally the biggest discounts or lowest prices are reserved for the helicopter companies largest clients. We have cut down the price of tours as much as we can to give you a great discount on the helicopter tours we offer. The tour companies know you are shopping by price and there are tours designed for different price points. The lowest price tours (including what we offer) usually involve traveling closer to the Grand Canyon to reduce helicopter flight time and increase ground commute time. Less time in helicopter usually means lower price. Grand Canyon West sells helicopter tours for as low as $139. The time it takes to drive to Grand Canyon West from your hotel in Las Vegas is most likely 2.5 hours, how much time does it take for you to get picked up from a hotel then taken to the helicopter terminal for check in? How long is check in? You may consider driving an extra hour (when you subtract out hotel pickup time and check in time for some tours) to turn a $300 helicopter tour into a $139 tour. See current helicopter prices at Grand Canyon West HERE Please note we have no affiliation with the the $139 tour so you need to contact them to get details about that tour. Helicopter tours are expensive so they are not for everyone’s budget. Many of these aircraft are over $2,000,000 with only 6 seats. If they are not in the air they are not making money so most of these tours offer limited time at the Grand Canyon. If you are shopping by price you may be missing the important details that make up the price such as the amount of helicopter air time as well as amount of time you get at the Grand Canyon leaving the non tour related activities (check-in, commute time, fuel stops,etc.). To put it another way how much time are you willing to sacrifice for non tour related activities for a lower price? Fortunately Las Vegas has a very good helicopter tour industry with some incredible companies and most people enjoy these experiences immensely. We hope to help you make it even better by saving you money on that endeavor. Front Seats: Almost everyone wants the front seats for the best view however there are only 2 front seats available out of six seats. Helicopters must be balanced by weight to fly safely. Your desire and willingness to pay extra for the front seat will always be secondary to weight balancing and safety. There is no company that can guarantee front seats before safety. The helicopter companies assign seating once they know actual passenger weights. Most of the companies will rotate seats if possible on flights that land to allow more than two people the opportunity to get the best views from the front. We can not guarantee front seats on any helicopter tour. Las Vegas City flights will fly around the Strip after sundown which is a great experience but please understand the two seats in the back of the helicopter that face the opposite side of the Strip may not have the great view. Unfortunately we can not guarantee you will not get those seats. If you book a city lights tour with us and you do happen to get those 2 seats in the back opposite the Strip we will refund back our portion of the cost (the amount we collect above our cost of the helicopter flight) meaning we make no profit on that tour, please note this is not a full refund. If you do not want the possibility that you may get those seats please do not book a tour with us. This refund offer applies to the Sundance City Lights tour only and no other tours. If you require specific seats on any helicopter tour we can not guarantee specific seats positions. Weight Restrictions do apply to helicopter tours as helicopters have a maximum weight capacity for flight. Please verify before booking what the weight limits are and understand that an additional fee may apply.